The Deploy Bar is used run your app, with a selected setting. Start in Desktop Browser will run your app, usually in Chrome, on your desktop. 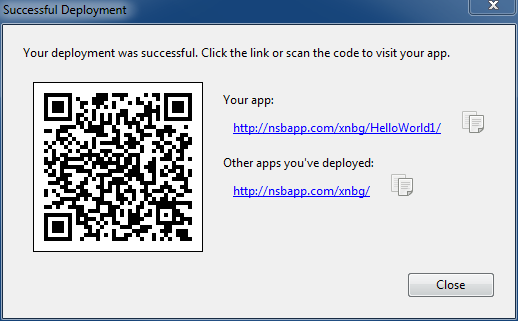 Deploy to nsbapp.com server will deploy the app to AppStudio's dedicated test server. Deploy to FTP server will deploy the app to a server you set up in Preferences. Deploy to a local server will deploy to a folder you specify in Preferences. Build Native App with PhoneGap transfers your app to the PhoneGap Build service, which will return a native app. 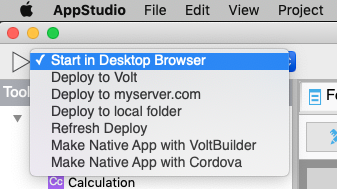 Build Desktop App packages the app so it can be submitted to Google to make a Chrome Packaged App. Use the QR code with a utility on your device to quickly load your app. This page was last edited on 25 November 2014, at 11:16.